A new snapshot from NASA?s latest space telescope hasrevealed a vast cloud in deep space that is brimming with new stars inside flower-like wisps of interstellar dust. 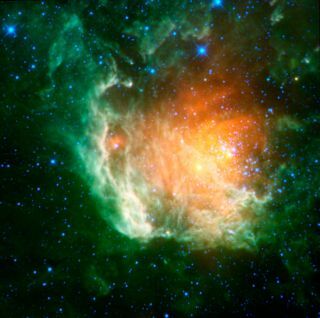 The spectacular infrared image shows the Berkeley 59 clusterof young stars, each of which is just a few million years old, as blue dots just to the right of the center of a dust cloud awash in red and green hues, leading NASA scientists to liken itto a giant cosmic rose. The new image was taken by NASA?snew Wide-field Infrared Survey Explorer (WISE),a $320 million space observatory built to map the entire sky in unprecedenteddetail. The infrared space telescope has already recorded stunning images of dark asteroids and comets that were previously unseen because theywere hard to spot in the visible light range of the spectrum. WISE?s view of Berkeley 59also includes a "champagne flow" of material resulting from the?supernova remnant NGC 7822, an exploded star associated with the region, saidofficials with NASA?s Jet Propulsion Laboratory (JPL) located in Pasadena,Calif. The objects are located in the constellation Cepheus about 3,300light-years from Earth. The dust?s red glow stems from heat shed by the stars, whilegreen regions outline the fringe of the cloud. The photo?s green regions owetheir emerald hues to molecules of a compound called polycyclic aromatichydrocarbons, which can also be commonly found on Earth in the soot frombarbeque pits, exhaust pipes and other combustion effects. NASA?s WISEtelescope is expected to complete its first all-sky map in about sixmonths.